Rheumatic Immune-related Adverse Events Associated with Immune Checkpoint Inhibitors for Cancer: Coming Soon to a Clinic Near You! Anna is a 71-year-old lady with metastatic non-small cell carcinoma of the lung with progressive disease despite three months of traditional chemotherapy. PD-L1 expression on her tumour was > 50%, and she was therefore started on IV pembrolizumab (an immune checkpoint inhibitor [ICI] that targets PD-1), every three weeks. Following the second infusion, she developed pain and swelling in the left ankle. With subsequent pembrolizumab infusions over the next six weeks, her symptoms progressed to involve both shoulders, wrists, metacarpophalangeal (MCP) joints and proximal interphalangeal (PIP) joints. She did not have any other adverse events from her ICI therapy. She was seen by rheumatology and found to have inflammatory polyarthritis with 11 swollen joints and 14 tender joints. Systems review and physical exam were otherwise unremarkable and she looked generally well. Her blood work showed C-reactive protein (CRP) 40.0 mg/L (up from a baseline of 5.0 mg/L prior to starting pembrolizumab), negative anti-nuclear antibodies (ANA), negative rheumatoid factor (RF) and negative anti-CCP antibody. Ultrasound confirmed synovitis in the wrists and MCP joints. She was started on hydroxychloroquine (HCQ) 400mg po daily, without prednisone. Pembrolizumab was held for one dose and restarted once her arthritis symptoms improved. Within two months of starting HCQ, she was entirely asymptomatic with no further tender or swollen joints. Ultrasound confirmed resolution of previously seen grey-scale and Doppler changes. Eighteen months later, her Stage 4 non-small cell lung cancer remains stable. She has successfully had 14 cycles of pembrolizumab (in combination with HCQ) with no recurrence of inflammatory arthritis. Immune checkpoint inhibitors (ICI) are monoclonal antibodies that modulate immune signals and use a person’s immune system to fight cancer cells. Targets of these antibodies include cytotoxic T-lymphocyte-associated protein 4 (CTLA-4) and programmed cell death 1 (PD-1). The success of these novel agents has been astounding, revolutionizing cancer care. People with previously refractory metastatic malignancies are now achieving stabilization of their cancer and, sometimes, long-term remission. Since the first ICI, ipilimumab, was approved for the treatment of metastatic melanoma in 2011, several others have followed for multiple tumour types, setting a new standard for cancer care. This therapeutic paradigm shift in oncology is akin to the shift that occurred in rheumatology with the introduction of the tumour necrosis factor inhibitors (TNFi). While ICIs have been lifesaving, it is not surprising that when the natural “brakes” of the immune system are inhibited, significant and often severe, immune-related adverse events (irAE) can occur. The development of irAEs is common with a reported prevalence of up to 60% in monotherapy, and up to 90% when used in combination. They can affect essentially every organ system, most commonly the skin, gastrointestinal tract, endocrine glands, kidneys and liver. Rheumatologic irAE that have been reported include inflammatory arthritis (IA), spondyloarthropathy, polymyalgia rheumatic-like syndrome, inflammatory myositis, vasculitis, sicca symptoms, Raynaud’s phenomenon and sarcoidosis. These irAE can occur at any time during treatment, may occur in isolation or in combination (particularly with other organ systems), and may or may not resolve with cessation of ICI therapy. The CanRIO group in Toronto in June 2018 for their inaugural meeting. Although rheumatologic irAE often resemble classic rheumatic diseases, the majority of cases are seronegative, and the natural history and prognosis remain largely unknown. For example, we do not know whether untreated inflammatory arthritis associated with ICIs will lead to erosive or deforming disease. Is there an urgency for early and aggressive treatment? Should we be employing the “treat-to-target” strategy? There are also many important questions regarding optimal treatment, including the type and duration of immune-suppressing treatment to be used, the effect of disease-modifying anti-rheumatic drugs (DMARDs) on irAEs and whether immunosuppression interferes with the anti-tumour benefits of ICIs. The latter is of particular concern since most studies suggest that patients who develop irAE from their ICI also have better tumour response. By initiating immunosuppression, will we be hurting their chance of tumour response? There is also a paucity of data on patients with pre-existing autoimmune disease and their “eligibility” for ICI therapy for cancer. In the majority of studies, patients with underlying autoimmune disease were excluded. As we know in clinical practice, our patients are often at risk for development of cancers, particularly melanoma. Should they still be eligible for this potential lifesaving therapy for their cancer? Severity of irAEs is graded based on the Common Terminology Criteria for Adverse Events (CTCAE), a scale that ranges from mild toxicity (Grade 1) to fatal toxicity (Grade 5). Most musculoskeletal irAE reported to date are Grade 1 to 3, although more severe ones have been described. Arthralgias are reported in 4-22% of patients on ICI therapy, with an estimated 1-7% having IA. The Society for Immunotherapy of Cancer (SITC) Toxicity Management Working Group put together system specific recommendations for managing toxicities associated with ICIs. For Grade 1 IA, they recommend continuing ICI therapy, and treating with non-steroidal anti-inflammatories (NSAIDs), prednisone 10-20mg daily, or intra-articular corticosteroid injections. Grade 2 IA warrants consideration of holding ICI, rheumatology referral and prednisone 20mg/day, increasing up to 1mg/kg/day as needed. Grade 3 IA requires holding of ICI, rheumatology referral, prednisone 1mg/kg/day and consideration of additional immunosuppression such as methotrexate, sulfasalazine, leflunomide and TNFi. In our case above, Anna’s irAE would be classified as Grade 2 IA. Her ICI was held for six weeks (skipped one dose) when her arthritis was at its worst. Fortunately, she responded to hydroxychloroquine, did not require prednisone or other DMARDs and was able to re-start pembrolizumab without recurrence of her arthritis or onset of other irAE. She continues to have good tumour response. Although the SITC recommendations are a good starting point for the management of irAE, they are derived from expert opinion and do not specifically address rheumatologic irAE other than IA. There is a need for broader recommendations to guide rheumatologists treating these patients and studies to help define optimal therapy. 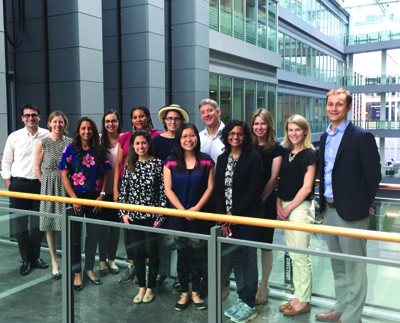 Thus, the Canadian Research Group of Rheumatology in Immuno-Oncology (CanRIO), was formed this year, with our inaugural meeting held in Toronto in June 2018. We are a working group primarily comprised of rheumatologists from across Canada with an interest in irAEs of ICI therapy. We hope that this collaboration will lead to sharing of knowledge between centres, development of rheumatology-specific management guidelines, and studies that will allow us to better define the natural history and optimal treatment of rheumatologic irAE. 1. Puzanov I, Diab A, Abdallah K, et al. Managing toxicities associated with immune checkpoint inhibitors: consensus recommendations from the Society for Immunotherapy of Cancer (SITC) Toxicity Management Working Group. J Immunother Cancer 2017;5(1):95. 2. Naidoo J, Cappelli LC, Forde PM, et al. Inflammatory Arthritis: A Newly Recognized Adverse Event of Immune Checkpoint Blockade. Oncologist 2017 Jun;22(6):627-630. 3. Postow MA, Sidlow R, Hellman MD. Immune-Related Adverse Events Associated with Immune Checkpoint Blockade. N Engl J Med 2018; 378:158-168.